Thanks to youtube I learned today how to crochet a square from a circle. It's a kind of granny square. I had these odd balls which are bulky weight and was thinking what I could do with them. 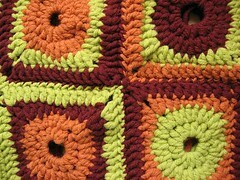 I think I might make a bag from couple of granny squares. I'm pretty excited and I find crocheting more portable than knitting. Looking forward to pictures! I agree, Youtube is a treasure. I find that if I'm having trouble with a book explanation, I go to Youtube and see if I can watch someone do it. So much easier! Which Youtube video did you use? I've only crocheted a day or two in my life, a very long time ago. I still want to learn to make a perfect circle with crocheting. I can crochet straight across, but always feel that my circles are ugly, so I rip them out. I've been an avid knitter for 30 yrs and just am wanting to learn crochet. It certainly looks harder than knitting. But, I have made my resolution to do so and have ordered some crochet books for beginners and am waiting for them to arrive. I am glad to see your lovely crochet granny squares. They look beautiful and remind me of my mother and grandmother who enjoyed crocheting more than knitting. You have a fantastic blog here also, I enjoy it very much.